Quick: what vehicle is nearly identically the same as the Opel Zafira Tourer Concept that was revealed in Geneva? 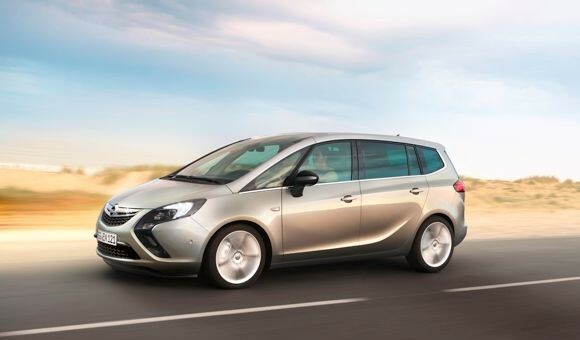 Answer: The Opel Zafira Tourer, although you won’t be getting an iPads or transparent roofs with this one. When it launches this fall, the Opel Zafira Tourer will feature three variants of the 2.0L CDTI turbo-diesel engine that will be good for 110, 130 or 165 horsepower. The gasoline offerings will be two variants of the turbocharged 1.4L ECOTEC engine found in the Chevy Cruze that will produce either 120 or 140 horsepower. All of which will have fuel saving Start/Stop technology. According to the presser, both six speed manual and automatic transmissions will be available. For the wildcard, the Zafira Tourer will also offer Compressed Natural Gas and Liquid Petroleum Gas options, a high performance powertrain and a new gasoline engine of “a new generation” after the vehicle’s launch. Intuitive safety features listed include a new radar-based Adaptive Cruise Control with Collision Mitigating Braking, which uses sensors to apply the brakes during cruise control to avoid collisions. Also new is the “Opel Eye”, which provides a Following Distance Indication (FDI) that tells the driver how far the vehicle ahead is, Forward Collision Alert (FCA) which basically warns the driver of an impeding collision with noises, and Intelligent Light Ranging (ILR) that adapts the headlamp low beam pattern in a way that keeps the Zafira Tourer from blinding drivers in oncoming vehicles. Pricing has yet to be announced. For more have a look at the presser below. Slap a Buick badge on it and call it the Century Tourer. Then Opel can redesign the Antara and bring that here as the Buick Encore. Next, a RWD flagship should make it way here.